Schwartz Living Market, Phillips Elementary and Pittsburgh History and Landmarks Foundation Collaborate! The children learned about Joe Liotta and how he has hand painted the signs since 1938! 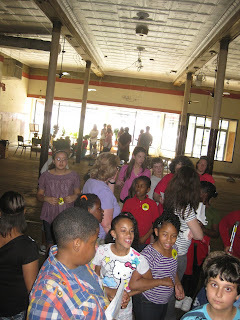 The students learned about plants and living buildings from Liz Lynch and Tara Alexander. Fourth grade students arriving at the market, in the sunshine, for a tour. Was it a long walk? 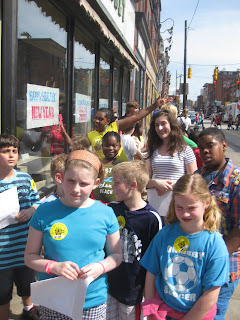 Schwartz Living Market at 1317 East Carson Street was infused with wonderful energy on Tuesday, March 20, 2012, when over 40 students from South Side's Phillips Elementary School visited. 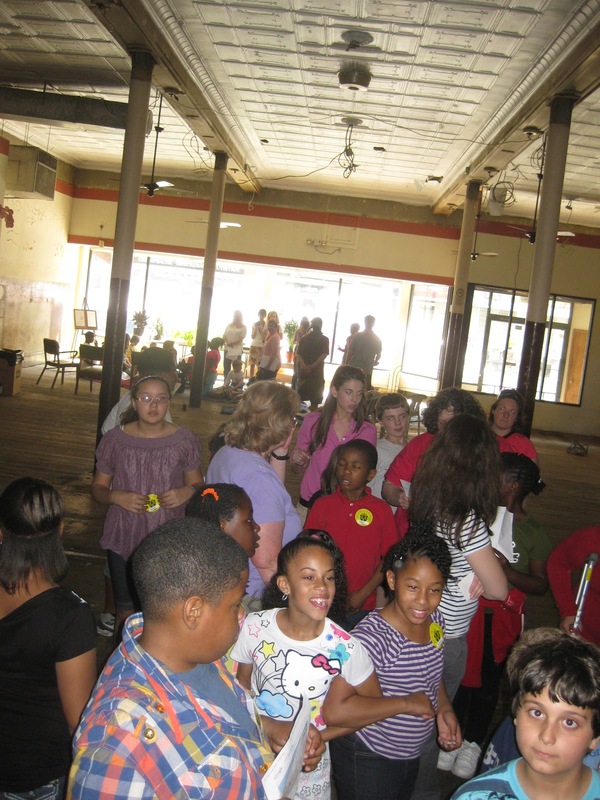 In collaboration with Pittsburgh History and Landmarks, the students had the opportunity to tour the building and learn about the project in the renovation stage. The children were able to learn first hand about the long term "living building" and "green" plans, see the newly exposed and primed original tin ceiling, circa 1850, we think, learn about how ice was used in grocery warehouses to keep food cold, peek into an old walk-in freezer lined with cork, stand in the giant freight elevator and do some awesome drumming to energize themselves, their teachers, and the space! That's a tall elevator shaft! 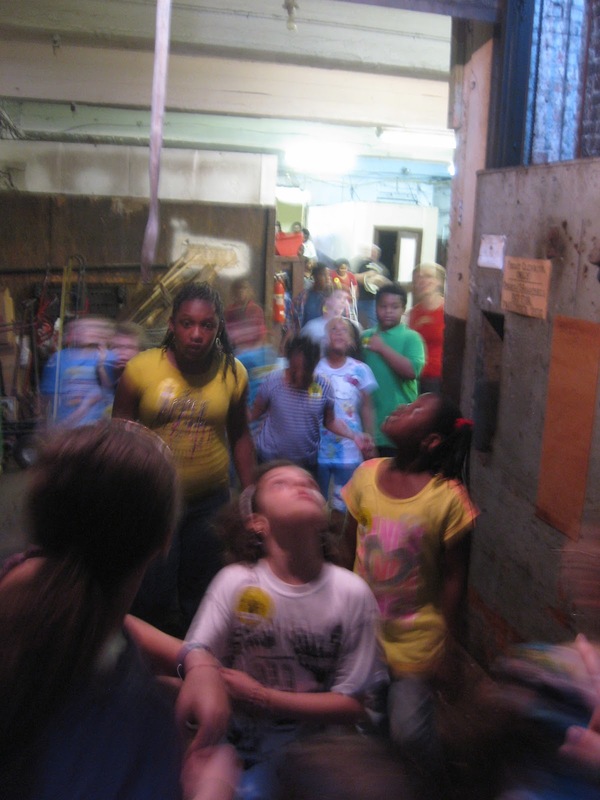 Phillips Elementary students walking from East Carson Street towards Bingham Street under a newly- primed tin ceiling in the Schwartz Market building at 1317 E. Carson Street. The kids learned about the rhythm of life from Chad and then had their own chance to drum and jingle, and feel the beat! Thanks so much to Phillips Elementary School, Pittsburgh History and Landmarks Foundation and the teachers, interns and parents that made this visit so memorable! Also a huge thanks to the Schwartz Living Market and 1317 E. Carson Street project team! Beautiful bright- eyed student at Phillip's Elementary School! 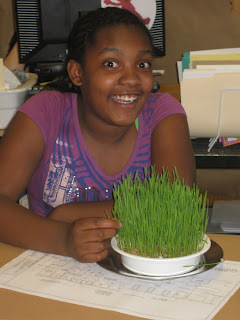 Curious students with wheat grass display. South Side's Phillips Elementary School in collaboration with Pittsburgh History and Landmarks welcomed participants in the Schwartz Living Market project at 1317 East Carson Street, to their school on Monday, March 19, 2012. Louise Sturgess, Executive Director of Pittsburgh History and Landmarks Foundation (PHLF) spoke about the historical nature of the Schwartz Market building and the importance of renovation and business development. Tony Albrecht, architect on the project, Brad Hochberg, the Energy Guy, and Elisa Beck, family member and the lady that is being called the developer at this moment in time, spoke with the children in two fourth grade classrooms. Stan and Laura Beck, also family members, were there along with several interns from PHLF. Mark, another architect and Tony's assistant, volunteered his time as the tech guy. Thanks so much all of you! Louise Sturgess, Executive Director of Pittsburgh History and Landmarks Foundation photographing students sampling wheat grass juice. It's alive! What a joy! Inquisitive student looking at photo of Schwartz Market with architectural plans below. Thanks so much for collaborating with us Phillip's School and Pittsburgh History and Landmarks! Tony Albrecht, Stan Beck, Laura Beck, interns from PHLF, Elisa Beck, teachers from Phillip's Elementary, Brad Hochberg, Louise Sturgess and Mark. Brad Hochberg of Energreen asking the children about "green" energy, the sun's energy, and tossing a model of a special energy efficient light bulb.